Remarkably Sunshine Tour talent Daniel Greene remains winless, but he won’t stop chasing hard, writes MIKE GREEN. Daniel Greene was just over two months into his professional career when he produced the kind of performance which may have upped the level of expectation to an unreasonable degree. He carded a final-round 65 at the Dimension Data Pro-Am at Fancourt in February 2010 to finish third behind Darren Fichardt and Louis Oosthuizen. Behind him were other eventual winners of that title, Branden Grace, Hennie Otto and Jaco Ahlers. Also behind him were the likes of Neil Schietekat, Dean Burmester and Louis de Jager, all of whom would go on to win on the Sunshine Tour. 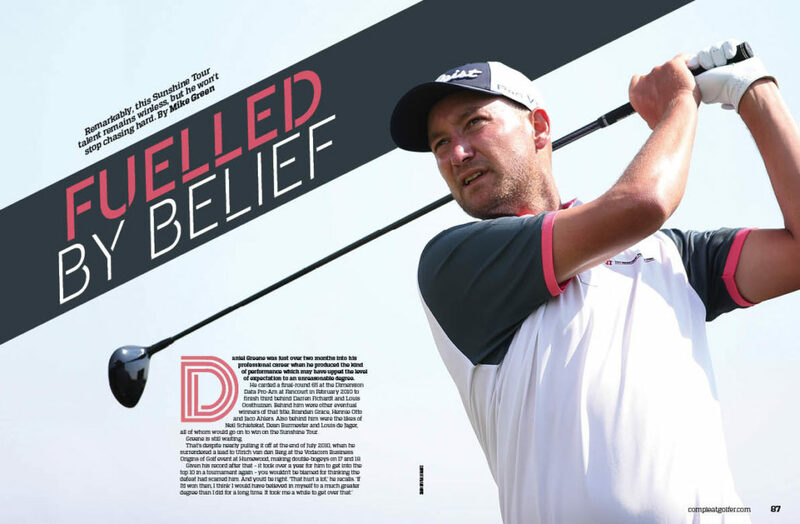 That’s despite nearly pulling it off at the end of July 2010, when he surrendered a lead to Ulrich van den Berg at the Vodacom Business Origins of Golf event at Humewood, making double-bogeys on 17 and 18. And when he made three bogeys in the final four holes at February’s Eye of Africa PGA Championship to let Louis de Jager through for the victory, one would have been forgiven for wondering whether he had, in fact, got over it. He attributes what appeared to be an implosion to a combination of bad luck and bad reads on the greens. ‘I didn’t play bad shots, especially on 17 and 18,’ he says. ‘I walked up to my ball after the tee shot, and the spectators told me it had bounced straight into the rough. I was expecting to find it in the middle of the fairway. It could appear that part of the problem is him playing too aggressively, which seems odd in someone as outwardly calm as he is. But no. ‘If I’m as laid-back as my old man, I’m the calmest person on the planet,’ he laughs. ‘And that helped me get through the tough times. If anything, I am perhaps too defensive when I play, and this was especially the case at Eye of Africa – there were times when I had a sand-wedge in my hand and I was overly careful with the shot because I didn’t want to go over the green and I ended up too short. For someone who has been so close to winning, not making the breakthrough was hard on him for a while. ‘There was definitely a stage when I thought about packing it in,’ he says. It was an easy path to follow back in 2015, when he had a chest injury. ‘I felt a pain in my chest while I was hitting balls and I carried right on hitting balls,’ he laughs. South Africa – at the 2017 Joburg Open. ‘I did find it tough to make the step up in the earlier tournaments,’ he says. In keeping with the trend South African players seem to be following in eyeing up foreign playing opportunities, Greene is looking at perhaps playing at the Asian Tour or European Tour qualifying schools. He was able to have a close-up look at Asian conditions, thanks to a stint on the bag of good friend Justin Harding. ‘I caddied for Justin at the WGC-HSBC Champions in Shanghai and in Kuala Lumpur two weeks before that,’ he says. ‘Clearly, Justin’s success in Asia has opened a lot of South Africans’ eyes to the possible success available if we choose that route, but the biggest takeaway for me was spending time watching Dustin Johnson – along with the other world-class players. He is so chilled. He will hit a bad shot – not too many, mind you – and just walk on to his ball to get ready for his next shot. And I thought I was laid-back,’ he laughs. So, with the loss at Humewood in 2010 in the rear-view mirror, and the one at Eye of Africa seemingly in perspective, it seems reasonable to assume a breakthrough is not too far off for Greene. ‘It’s something I can go after with more confidence now,’ he says. He’s not going to put his head on a block and say where it will come, but it seems likely it will be at a coastal course. ‘I normally play well at the coast,’ he says. ‘When I played the interprovincial as an amateur, it was in Durban. I’ve played a lot of golf in Durban in the wind, and I find I play well at places like Fancourt and St Francis Links.